HODEIDAH, Yemen – Escalating violence in Hodeidah, Yemen, threatens the city’s estimated 90,000 pregnant women and girls, UNFPA has announced. Some 14,000 of these women and girls are likely to encounter pregnancy-related complications requiring emergency care, but access to health services has been severely limited by the ongoing crisis. The only major referral hospital in the city, Al Thawra Hospital, was the site of a brutal attack last week. “I felt I was in hell because of what I saw,” said midwife Noha, who was working at the hospital’s obstetric ward when the attack took place on 2 August. “That day, I was hearing gunshots since early morning. At 5pm, we heard a very loud explosion at the hospital gate. I ran to the scene to see what was happening,” she recounted. 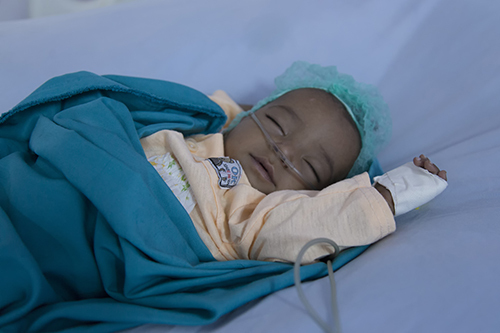 Despite the attack, Al Thawra continues to operate, serving as a major obstetric and neonatal facility for the city. UNFPA is supplying the hospital with reproductive health medicines and materials, and is helping to establish an additional maternity ward and operating theatre there. UNFPA is also providing supplies and support to midwives and gynaecologists across five districts in Hodeidah. But fear and insecurity are keeping patients from seeking urgently needed care. UNFPA is supporting maternal, postpartum and neonatal services. The humanitarian crisis in Yemen is one of the worst in the world, with 75 per cent of the population requiring some form of assistance and protection, according to the United Nations Humanitarian Coordinator in Yemen. The country is additionally grappling with a widespread cholera outbreak and the threat of famine. Conditions for women and girls are particularly dire. 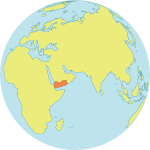 Yemen has one of the highest maternal mortality ratios in the region; in 2015 it was estimated that 385 women died of maternal causes out of every 100,000 live births. Today, the maternal death rate is likely to be significantly higher, as the conflict has cut off access to health services, medicines, food and livelihoods. UNFPA is scaling up efforts to support health facilities in Hodeidah, Aden, Ibb and Sana’a. But the situation in Hodeidah is particularly stark. More than 70 per cent of all humanitarian assistance and food imports arrive through the city’s port, which is operating at limited capacity. The city is also badly affected by the cholera crisis. The Al Thawra Hospital attack has alarmed humanitarian experts and officials. “Targeting medical facilities is strictly forbidden under humanitarian law, as it serves no purpose other than depriving people, in particular women and girls, from much needed life-saving services,” said Dr. Luay Shabaneh, UNFPA’s Director for the Arab Region. But it is far from the first health facility to be affected by the conflict. 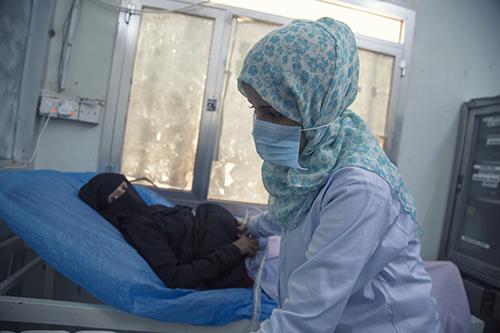 Only one third of Yemen’s reproductive health facilities are currently functional, with many clinics shuttered because of the violence, mass displacements, economic collapse, departure of health workers and lack of supplies. Ahlam, 32, was unable to receive antenatal care throughout her pregnancy because the roads were disrupted. When she went into labour a few days ago, she was afraid to leave the house. Finally, she was transferred to Al Thawra hospital on Monday. There, Noha saved her life, but it was too late for the baby. “I lost my child,” Ahlam said.